The fireworks were flashing, the music was pumping and the crowd were on their feet cheering. It was June 2012 and the American LFL All-Stars were playing an exhibition game in Brisbane. Sitting in the stands that night were Brooklyn Jackson and her sister who went along to watch some hard hitting women’s sport. On the way home Brooklyn’s sister said ‘You should do that!’, and they both laughed it off. When they arrived home Brooklyn googled the LFL to see what it was all about. She came across a facebook link that mentioned the upcoming New South Wales LFL trials. Two days later she flew down to Sydney. Pretty courageous stuff considering Brooklyn had only played sport at school for the social aspect and never really pursued it once she left. So here she was lining up with over 60 athletes in Acer Arena at Homebush. She went through all the required tests and drills however when it came time to announce the successful girls she did not make the cut and missed out on selection. Waking up the next morning Brooklyn set herself a goal to try again once she was in shape and could prove her worth. It was four days later when she heard about a local Sydney ladies gridiron league that were looking for players so she hooked up with the Bondi team. Considering she had exercised a total of three hours for the whole year it was a surprise that she made it through the first training session with the team. She stated, “It was pretty intense and intimidating amongst such established athletes’. Her next step was to find a nutritionist to keep her on track. So in the space of a month she went from no training at all to 2-3 nights a week with the Bondi team along with three sprint training sessions for speed. This went on for four months as she stepped up her training to six days a week. One of the Bondi coaches was Michael Vrcelj who said of Brooklyn, ‘With a white-hot focus and determination to compete and succeed, she would have been elite at anything – this sport just happens to have chosen her, and she thrives on the physicality demanded. Her mental and physical transformations over the past year have been amazing. To quote my old football coach, Brookie epitomizes the, “If it is to be, it is up to me” attitude’. It was during this time that Brooklyn joined Hybrid Athletic-Development to mould her body into peak physical condition. Within 12 weeks she made some incredible body transformations and was called up to train with the NSW Surge LFL squad. Joe Kormanyos from Hybrid Athletic-Development had the following to say, ‘Brooklyn lives and breathes training. From novice trainer to a chiseled athlete, she epitomizes what hard work fuelled by big dreams can achieve. It has been a true privilege to guide her on her journey’. Brooklyn says of Joe, ‘He kills me everyday. If I am not training with him, he is calling me up and checking on my diet and where my head is at’. Good friend and training partner, Shani Sleeman added, ‘She’s motivated, a goal setter, a hard worker and the most hyperactive (in a good way) individual I have ever met”. The LFL call up was from NSW Surge coaches Jason Gaffey and Teren Tan. Brooklyn was so happy that she rang her family while crying tears of joy down the line. “Receiving that email was the best day of my life, it made me want to work even harder’. Brooklyn initially felt nervous training with the Surge however she now feels right at home. The next step was attending the final trials where more new athletes stepped up to tryout for a coveted spot in the squad. The LFL Commissioner Mitch Mortaza was in attendance. Brooklyn said of the day, ‘I was extremely nervous however I knew that I had done everything possible over the previous 10 months to make sure I was part of the NSW Surge’. She felt triumphant on hearing that she had made the squad saying, ‘It made me realize it was just the beginning of the next episode. There is nothing more I want at this time of my life’. Brooklyn continued, ‘Never give up on something you can not go a day without thinking about. Since I first saw it, I dreamt it and now I live and breathe it, so hopefully soon I will become it’. NSW Surge sessions are intense. Every player is chasing their dreams and the chance to be part of the inaugural Australian LFL season. It is pushing them all to a higher level of athleticism and discipline. Brooklyn thrives under pressure and likes to push herself to the limit and she never thought she would get this far, so every day is a bonus. She adds, ‘Being around such amazing driven people everyday is an absolute pleasure’. Fellow Surge teammate Bonnie Gillespie loves having her in the team, ‘Brooklyn is a strong individual that hates the words I can’t! She puts her all into everything she does and she never gives up! She pushes others to reach their goals and that is what I call I true achiever’. Her short term goal is to make the final NSW Surge team that runs out onto the gridiron this December. Long term she wants to be an offensive weapon and protect her Quarterback. When asked what she would say to other girls considering the Legends Football League she gets excited and says, ‘DO IT! It is the best decision I have ever made. Not just physically but mentally it has made me a stronger woman’. Brooklyn has come a long way since that night she watched the All-Stars game in June last year. The transformation has been incredible. What you see now is a fit, confident and dedicated young lady who is at her athletic peak. Make sure you get out to an LFL game this summer. The NSW Surge first game is on Saturday 7th December against the Queensland Brigade. It is sure to take the Country by storm. Just like Brooklyn these women train hard and are sure to entertain the crowds with their athleticism and skill. This entry was posted in Legends Football League, More Sport and tagged Australia, Bonnie Gillespie, Brisbane, Brooklyn, Brooklyn Jackson, gridiron, Hybrid Athletic-Development, LFL, LFL All-Stars, lingerie football league, New South Wales, NSW, NSW Surge, Queensland Brigade, Sport, Surge, Sydney on August 10, 2013 by bradeveleigh. Cue the smoke machine, fireworks, loud pumping music, strobe light.………. It is December 2013 and the announcer walks to the centre of the field and turns on his microphone to get the crowd whipped up to a frenzy. ‘Laaaaaadies and Geeeeeentlemen welcome to the first ever Australian Lingerie Football League game. Please raise the roof as we introduce each Sydney team member into the Allphones Arena. Lets hear a huge home town cheer for your starting Quarterback Renee Straumietis’. Ok we are back in June 2012 and you are probably wondering who this fiesty, determined, athletic girl is that will no doubt be taking Sydney by storm in 18 months time. Could she be the first Sydney LFL Quarterback? I am betting she is odds-on to be just that! Renee Straumietis is one of Australias unsung sporting superstars who would no doubt be a household name if she was representing her country in one of the ‘more popular’ sports that get the press and TV time. If you were an Australian baseball fan then her name would jump off the page and smack you right between the eyes. She began competing in Baseball when she was eleven years old, playing for her local team the Greenway Giants. At the age of seventeen in 2001 she made her first Australian representative team. She was the only NSW player in that squad! Eighteen of them were from Victoria. Two National Championships for NSW were to follow as well as competing in three IBAF World Cups. They were in Canada, Taiwan and Japan. When she was at the peak of her powers she was the fastest pitcher in Australia. Her fast ball was clocked at 76mph. No wonder she put the fear of God into the opposition. Infact in 2006 at the Nationals she threw a complete game shutout against Victoria. It is also worth noting that Victoria won the titles on either side of the NSW victory so they were no easy beats. Of her time in Baseball Renee said ‘Baseball has been amazing and has allowed me to travel to numerous contries. I’d still probably be playing now, but cost and time off work has been a big influence into why I’m not playing representative baseball anymore’. Her old team mate Amy believes that Renee would still be a huge asset to the National team saying ‘I would dearly love to see her back on the Australian women’s baseball team as she was a great player’. So what does a girl with a killer arm do when she is looking for the next challenge in her sporting career? Most would consider taming it down and trying out netball or volleyball. Not this focused and determined girl, she thought she would give Gridiron a crack. 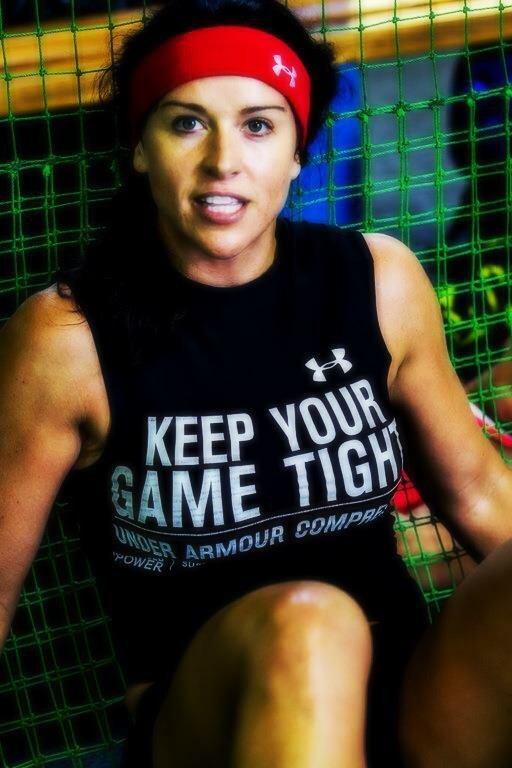 Renee joined the Ladies Gridiron League which is a recently established Womens Gridiron League. It all started off with a squad of girls who all came together through word of mouth and have just recently split onto teams which are based at Concord, Sutherland, Newcastle and Bondi. It was during pre season training that Renee and a few team mates heard of the Lingerie Football League having try outs for a Sydney based team. Last Thursday night she rocked up to All Phones Arena in Homebush to have a bit of fun and see what it was all about. After everyone registered at the door they headed out onto the field and went through a series of warm up drills and exercises with American LFL All Star Liz Gorman. The place was buzzing with nervous energy as Eighty-six girls were put through their paces. The LFL Chairman and Commissioner Mitchell Mortaza was on hand to help spot the talent. The first drill was to pass the ball and judge the girls on their Quarterback skills. Renee threw her first ball very well however the second ball was a little wobbly so the trainers continued to throw the ball to the next girl. Renee later said ‘the ball was totally different to the ones we have been using at practise, it was so much smaller and way lighter’. Luckily for Renee they came around on a second loop of the froup and she nailed every single pass. She was the first girl to get the tap on the shoulder to be pulled aside for some extra throwing at varies distances. At the time she thought to herself ‘It’s all happening’. This entry was posted in Legends Football League, More Sport and tagged Australia, LFL, lingerie football league, NFL, Sydney on June 3, 2013 by bradeveleigh.